Leeks are used everywhere in Greek cooking and you’ll find them in everything from pies to soups to salads. In this recipe, the mild, gently sautéed leeks complement the potatoes without overwhelming them as onions sometimes do in potato salad. You’ll notice the difference immediately. Leeks can be braised, boiled, roasted or sautéed as they are here to distinctly, deliciously flavor the olive oil. 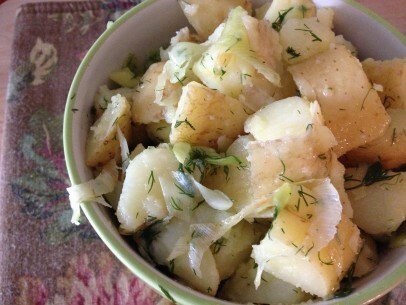 And fresh dill and potatoes – well, my Yiayia used to call them αγαπημένοι or sweethearts. They are just meant to be together! Fresh dill is imperative here, don’t be tempted to replace with dried dill. And remember to add the fresh dill to the leeks and olive oil only when the pan is off the heat. 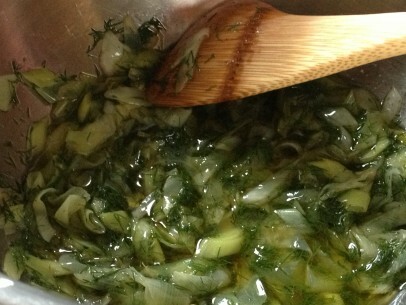 The less you actually cook the dill, the dillier it will taste in the final product. New potatoes are my first choice for this recipe. They hold together well, are not waxy and the skins are tender enough to leave on. Because cutting boiled potatoes is often a mushy, messy endeavor I suggest you cube the potatoes before boiling. 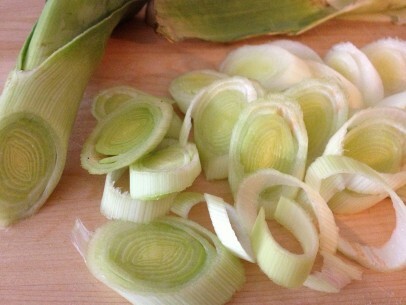 I like to slice the leeks on a slight angle to get longer strips/rings but it’s totally up to you. Make sure you wash your leeks well because they can be a bit gritty towards the bulb end. For this recipe, use the sweet white bulb and most of the light green stem above the bulb but not the tougher dark green leaves. Save these for stock, they’re full of flavor! 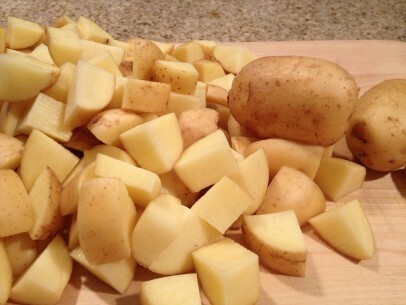 To boil potatoes: Place cubed potatoes and 1 tsp salt in pot, cover with water, cook on high heat until water boils. Once water is boiling, time approx 10-12 minutes or until potatoes are just fork tender. Drain and set aside. Heat olive oil in pan on low and add leaks. Gently cook for approx 5 minutes, stirring often, or until they are almost translucent. Remove from heat and pour sautéed leeks with all of the olive oil from the pan into a large bowl. Add fresh dill and salt. Mix well. Add boiled, cubed potatoes to the bowl and CAREFULLY mix well until completely combined. Mixing too quickly or roughly will give you broken, mushed potatoes so go slow with this last step. Garnish with fresh dill, a squeeze of fresh lemon and fresh ground pepper. Serve warm or room temperature. Kali Orexi! Find 50 of your favorite nistisima recipes, including potato salad with leeks and dill, in one convenient and beautiful collection of 40 full color, glossy pages – Nisteia Magazine! Lovely, I will do this tomorrow. Thanks for making me remember! 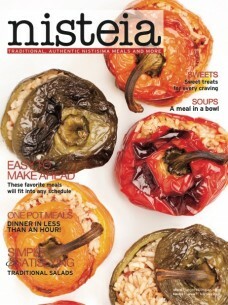 This recipe really brings memories from my mam’s kitchen in northern Greece! She would add some mustard in the end, just because! 🙂 Thank you!